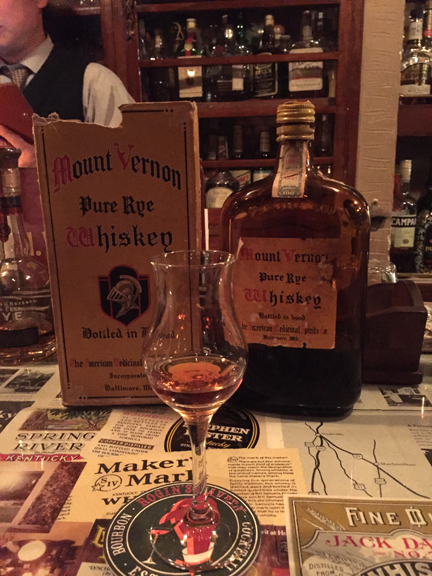 Written for the Baltimore American Whiskey Club (BAWC) by Owen Lang. A traveler in Edo period Japan making their way from Tokyo to Osaka by way of the Tōkaidō route would make their last stop in Moriguchi. They might stop for the night, and have a meal and a drink. Today, across from a post marking the very location of that stop, lies Rogin’s Tavern, the ultimate in bourbon destinations. 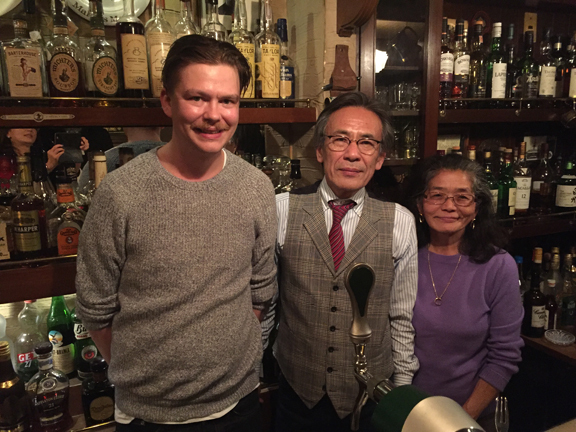 Proprietor Seiichiro Tatsumi opened the tavern in 1977 in the same location that his family has had business for 16 generations. A man of many interests, whether it is restoring old jukeboxes, or tooling around the countryside in an Aston Martin, he always ends up back in the bar with a glass of bourbon. His collection of bourbon has grown over the years, thanks to his tireless search among the backroads of the United States. Based out of his farm in Lexington, he drives along backroads until he sees the faint neon glow of a liquor store. If the store has been around long enough, there might just be a dusty case in the basement. If there’s a dusty case in the basement there just might be a chance for this charming man from Japan to name the right price. 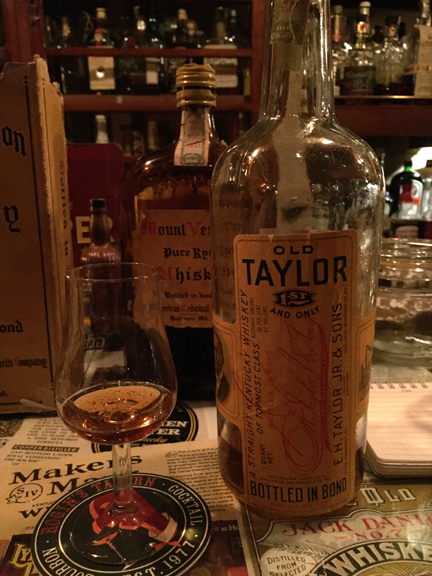 I spent five days drinking my way through the history of American whiskey at Rogin’s Tavern. Every night in Osaka, I would return to his bar as the crowds died down, and spend the rest of the evening, tasting, talking and listening to vinyl records. As we made our way through his collection, his recollection of where he purchased things astounded me. Sipping on different eras of American whiskey, I began to notice distinctions. The bold, robust flavor of pre-Prohibition era whiskey. The slight corn flavor that crept in during the 50s ad 60s. The smooth crispness that trended in during the 70s and 80s. In the mid to late 80s the modern taste solidified. Whether this has to do with the grain bill (non Roundup ready wheat?) the barrels (old growth timber?) or simply changing tastes, I can’t quite tell. The grain bill for Ancient Age seems to exist in all eras, and if I was capable of taking better notes (forgive me, I tasted at least 10 varieties every night) I could point to specifics. Suffice to say, there are distinct eras of American Whiskey that I had never been able to taste before. Rogin’s Tavern is chocked full of whiskey memorabilia. A traditional bar that would not look out of place anywhere in the United States is on the first floor. A jukebox (restored by our erstwhile proprietor) plays in the corner, and a wide selection of whiskey covers the bar. A food menu hangs from the wall letting you know that you can get fried chicken, or cheesecake (Tatsumi-san’s mother’s recipe!) The first floor bar is accessible from the Moriguchi stop of the Keihan line. Climb up the stairs to your left and you will enter a whiskey monger’s heaven. A few tables, and a long squat bar are surrounded by a collection of whiskey bottles full and empty. The entrance to this level is also at street level, but on the other side of the building, on an old road that used to run along a river. This road (as I learned late one night after a few too many) is called “space-time” road. The second floor bar was his first, and he had been open seven days a week until just a few years ago, when he decided to cut back and close three Sundays a month. I have to say, if I had that collection of whiskey around me, I wouldn’t mind working seven days a week either. On my last day in Osaka, Tatsumi-san had something very special in store for me. We agreed to meet for lunch. He chose his favorite spot for grilled eels; when his wife found out, she had to join us, because these eels are not to be missed. We arrived as the restaurant was opening, but still had to wait for the first round of customers to be served, because we were not the only ones ready for this fine meal. He joked about the “sour mash” sauce that they season the eels with. A barrel of fish sauce that has been in constant use for 100+ years. When we were finally invited in, I had a front row seat for the process of taking a live eel and turning it in to the most heavenly grilled dish I experienced in Japan. A simple preparation of grilled eel dripping in sauce on a bed of rice. The taste and texture were out of this world. After lunch, we parted ways with his wife, and headed to a liquor store in another part of town, so I could pick up some export only bourbon to take back with me. After selecting several bottles of bourbon I’d never seen in the states, we ran in to a friend of Tatsumi-san’s who happened to be the local Willett rep. We headed to the basement for an impromptu tasting of a handful of outstanding Willett bourbons. As we were leaving he presented me with a mini bottle of 18 year old Noah’s Mill. Feeling wonderful, and carrying a giant box of bourbon, we split up so he could go open the bar for the night. After a few hours of touristing around, and an outrageous punk show, I made my way back to Rogin’s Tavern for one last night of tasting. On the agenda was a selection of corn heavy whiskeys spanning 30+ years. I finished the night with a Sazerac, and said my final goodbye at around three in the morning. I walked down space-time road to my apartment thinking to myself, what sort of scheme could land me in Osaka permanently. Moral of the story? Run, don’t walk to Rogin’s Tavern in Osaka, before I go back and finish off all of those delicious bottles. great piece. me needs that unagi! Great read, sounds like an awesome trip off the beaten path through American whiskey culture. Hope to see you Japan or baltimore. Myself and two co-workers were at Rogin’s one of the nights you were there. 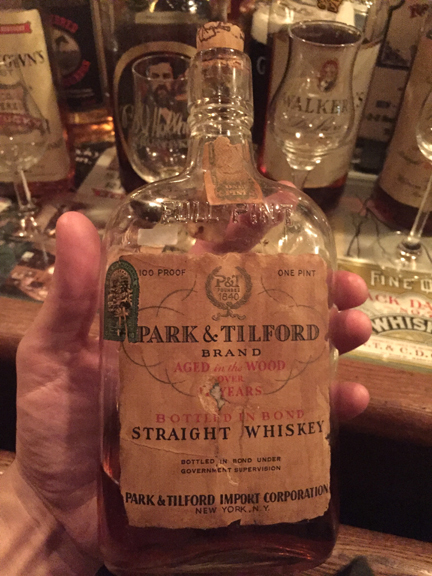 I also ordered a dram of the 1914 Col Talyor while I was there and you might remember me taking photos of it and the original wooden crate Tatsumi-san has. I’m heading back in early January for work and am going to make an effort to get back to Rogin’s for another trip back in time. Do you remember the name or location of the liquor store Tatsumi-san took you to? 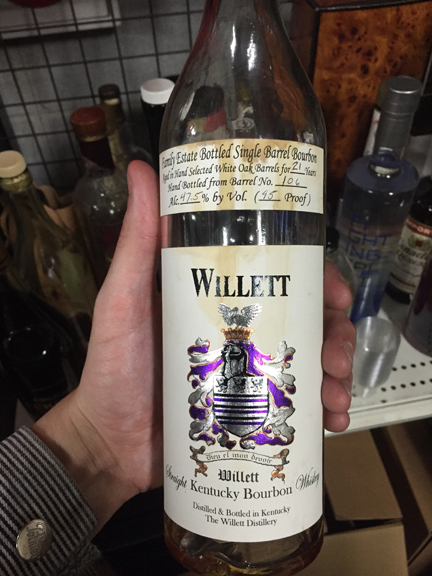 I found a liquor and beer distributor about 2 years ago in Sakai where I bought some Weller, Elmer T. Lee and a bottle of Blanton’s SFTB but would be interested to learn what you were able to aquire with Tatsumi-san as your guide.